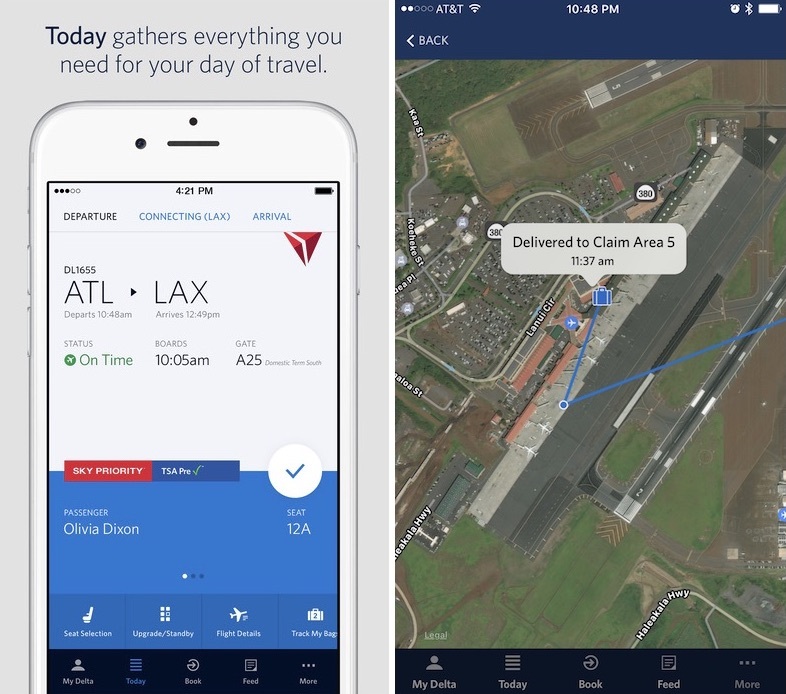 Delta Airlines recently announced an update to its Fly Delta app that will allow customers to track their luggage by following its journey on a map of the United States. Using RFID tags on a user's bag, which the airline introduced earlier in the year, the app shows the luggage's "last known location," determined by the airport at which it was most recently scanned (via CNN). When the app is first opened, users see a glimpse of a zoomed out map of the U.S. and they can catch up with a bag's journey as it travels from one airport to the next, eventually zooming in on its most recent leg of the journey. The step of the bag's progress at each airport is marked by a pin, with its most current location represented by a suitcase icon. If a user taps any of these pieces of UI, more information about the location and bag's status will be displayed. While the update is available now, Delta said that push notifications won't be coming until later in the year, but will "offer Delta customers down-to–the-minute updates on their checked baggage." The 4.0 update also introduces an integration of boarding passes into the "Today" screen, and a tweak to electronic boarding passes now allows them to automatically update with seat, gate, and flight information. Ah, so you're the guy trying to force a large carryon suitcase into the overhead bin of a small regional jet, even though it's physically impossible, and arguing with the flight attendant that it will be able to fit, then eventually giving up and deciding to allow them to check your bag, and holding up departure while I sit there, watching the precious minutes in my already short layover tick away. Thank you, the world needs more people like you. I assume you at least put a bag in overhead, which has to be closed and out of sight during your flight for safety reasons? But my wife and I do the exact same thing. Too many stories about lost baggage. Who needs to deal with that added stress during a trip which is normally stressful for other reasons already? Okay, technically you are correct. I place my carry-on in the overhead, so I cannot see it. But I know where it is and it is going wherever I go because it right above my head. I had a bad experience on one of my trips to France where it took three days to get my bags to me. That was the last time I checked a bag in (that was 2005). "offer Delta customers down-to-the-minute updates on their checked baggage"
Down to the minute updates will only help if the status is understandable. While at our layover in Atlanta this past Christmas (2015) Delta's app reported that our luggage was on the "carousel" in Atlanta. The Delta staff at our gate thought maybe that "carousel" could mean that it was in route to the next plane but they were not for certain. Obviously we were concerned that carousel meant outside security in baggage claim - which would be a problem. A couple of hours later the app showed the bags were caught up with us and on the plane - which meant two hours of unnecessary worry. It would have been nice if the app had stated something more specific in the status/description to indicate it was in route to the plane. Of course, if your bags are on the same planes you're on, like you'd expect, and end up on the same claim carousel as everyone else's bags from your flight 20 minutes after you land, like you'd expect, there really shouldn't be much to track with this app. 1) People who look at the app and realize that their bag is headed to Frankfurt while they're sitting on a plane headed for Tokyo. 2) People who already lost their luggage and are enjoying watching their clothing take an around-the-world jaunt while they sit in a hotel room on vacation. 3) The annoying road-warrior pacing anxiously at the baggage carousel and ranting at somebody on his cell phone because he's been waiting five whole minutes for them to unload the plane. Maybe it will soothe him where the booze on the plane failed to. Personally, my family has been using large suitcases to shuttle stuff back and forth to Japan for almost 20 years, and we've yet to lose a suitcase. Although, my wife's bag did manage to get home a couple hours before she did recently, which was confusing because I wasn't aware there was an earlier plane her bag could even have been on. Business travel less than a few days, just shove some clean underwear, a granola bar, and a laptop in a backpack and call it good. Sounds great. However, I gave up on the whole luggage thing. I do carry-on only. Never out of my sight.